I was tossing on the bed, yawning till my eyes watered and yet, there I was. No closer to sleep. I opened my palms, laid straight and imagined myself relaxing one muscle at a time. The corpse position. That usually worked, and I’d wake up in the morning. It was not to be – ten minutes later, my eyes were still brighter than an owl’s. Before lights out, I was doing a search on my phone for harnesses. Specifically, dog harnesses that would help Bessie (my 12-year old dog) retrain and regain the use of her back legs. Nerve damage, the vet said. Arthritis was another. She couldn’t control her left leg last Wednesday, and her right leg is stiff, so getting up was a challenge. She’s not in danger of any sort (except for wounding her backside from all the dragging around she’s doing), so that’s my consolation. My mind spins all the time. It goes into overdrive when I need to do something. Anything. Especially when it has to do with family. And Bessie is family. Sure, she’s not dying, or in pain. But the crux of being (too) creative for my own good and taking no for an answer is at the back of my mind, there’s always a voice that says “what else can I do?”. So my Google search history is rife with keywords like “dog”, “harness”, “back legs”, “DIY”, “nerve damage”, “how to heal” and “physiotherapy”; in multiple combinations. My mind makes a mental tally of the materials I have on hand that could be fashioned into a sling that would support her back legs while she walked. Tough cotton calico, some bag straps, or how about that unused tote bag that I could tear the sides of, so that it could support her weight and save my back at the same time? I made quite a number of iterations on the design – all of it in my head. Velcro, knots, and sewing. It felt like I watching Project Runway for canine accessories. I was reminded of the time when Cookie was ill. I had educated myself on canine cancer so well that I could understand the vet when she voiced out medical jargon, I knew exactly what she meant, and I spoke the same lingo effortlessly. When I woke up the next day, lethargic and dazed after not sleeping well (for the past week), I realised I have a problem. “I might be suffering from anxiety”, I told Mr. T.
Waiting, to me is painful. Because I can’t just sit there and fidget. I need to do something. Anything, that can help the situation. Don’t even get me started on my optimism, which I’ve heard from some people can be too infectious for my own good. 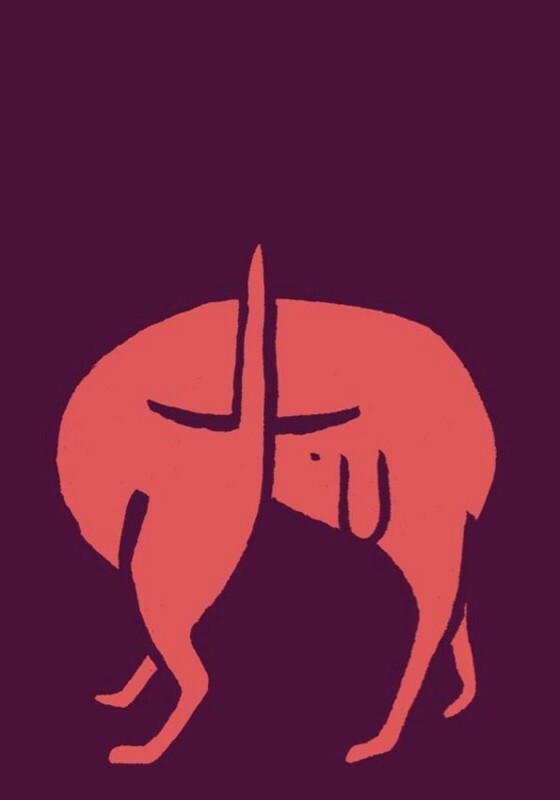 And so I look at things from every conceivable angle – down to the downright silly. I formulate a Plan A, B, and C. I come up with plans and explanations for myself as a coping mechanism when things go wrong. And always, always a backup plan. There’s no such thing as not trying in my vocabulary. This skill that I’m good at – thinking and creating solutions to problems – has been the bedrock of what I do. I love to analyze, think and contemplate. I love to measure and experiment. It’s made me sharper; as teacher and student. I can parse information and data to arrive at a hypothesis. I can see (and prove) if they’re true, through many different ways. But when it comes to matters of the heart, this skill of mine, has turned me into a ball of mess inside. I feel like throwing up randomly. When I stop what I’m doing. While lying in bed. It manifested in me getting massive motion sickness at a movie. Bessie isn’t data nor information. She’s furry, black and brown. She doesn’t like hugs. She’s my first dog. She’s seen me as a university student, struggling to finish my final project – and stayed up with me. She’s the first to greet our family in the morning and when we come home from work. And I’ve short-circuited myself by thinking too much. The equation that I’m seeking can never be found; it can never add up to an equal or finite amount, because it’s not tangible. So my new plan is to just do everything I can, and hope for the best. It’s also time to exercise more as well, as it usually helps disperse my worry-wart tendencies and calms me down. It’s easier for me to focus on other things instead of myself (I bet it’s the same for a lot of you out there), so I need to remind myself every now and then that it’s okay to slow down and take a breath. Optimism is totally fine, except when it’s bordering on denial. I’ve learned that my ability to rein myself in emotionally is merely an illusion, especially when it comes to furry folk, family and friends. And maybe that’s okay. For everything else though, it’s game on. Howdy folks! 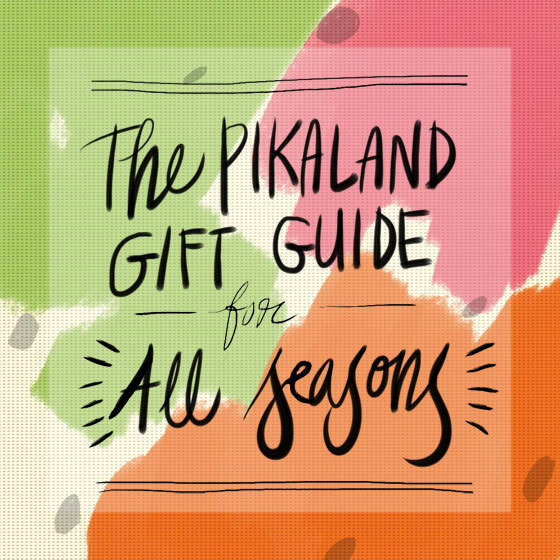 For part 6 of the gift guide, I’m taking a bit of break from books (although you can see it’s not a 100%) to show you what other fun stuff that’s perfect as gifts for all seasons. This list is a little off-beat, quirky and it’s made up of things I know a creative would love. While I know that Christmas may be the biggest gift season ever, but a surprise gift anytime of the year makes the heart grow fonder (this is definitely from my own experience!) Enjoy! These special edition Pocket Notebooks was illustrated by Avinindita Nura from Bandung Indonesia, sold in a set of 3: School Kids, Daily Life and Dance Floor. Need I say more? Printed on 300gsm evolution stock, available here. 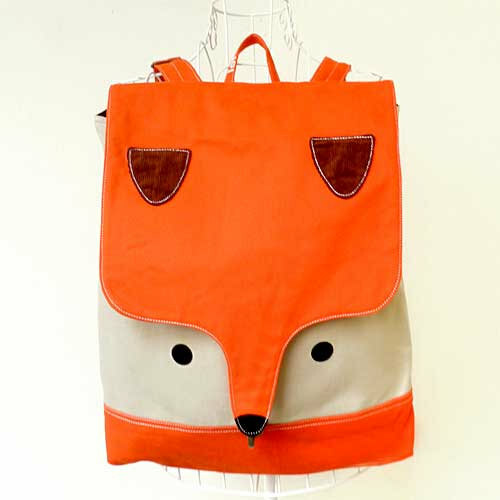 This backpack is fabulous for guys and girls, and was inspired by the Fantastic Mr. Fox by Roald Dahl. It’s made to order though, but perfect for the foxy someone in your life. Available here. The instant PDF download for this mask is great for last minute gifts – although assembly on your own will take approximately 3-4 hours. Time to get out your rulers, cardboard and scissors for a gift that’s truly handmade. 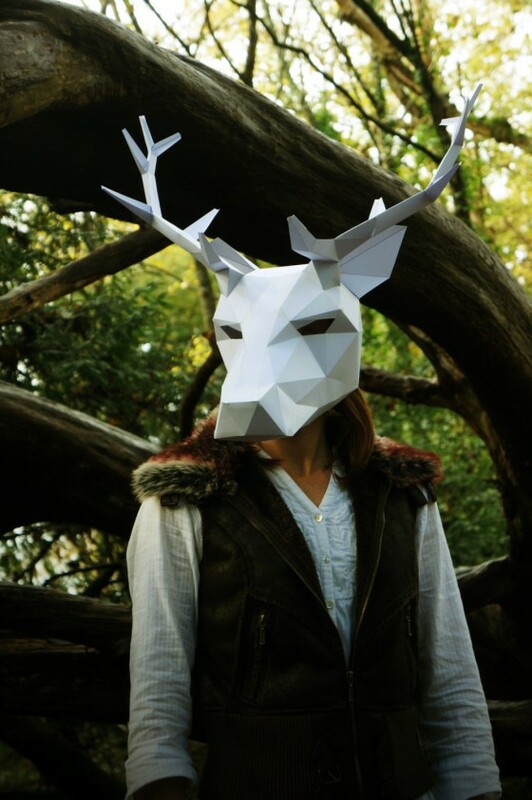 More animal masks available too from Wintercroft, and this set is available here. Writing things down never gets old – and my books are usually filled with to-do lists. 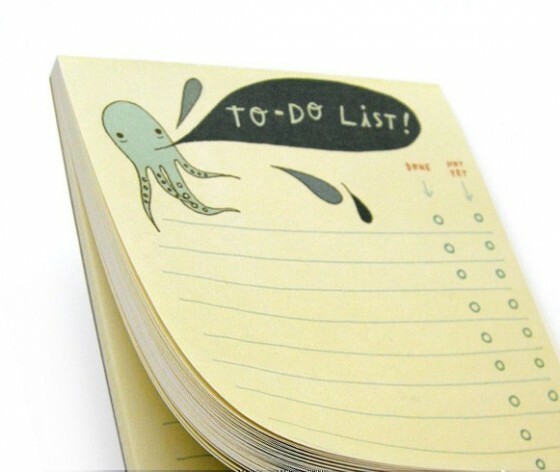 If you like yours neat and organised, get this fun notepad by Susie Ghahremani to keep your list in check. Available here. 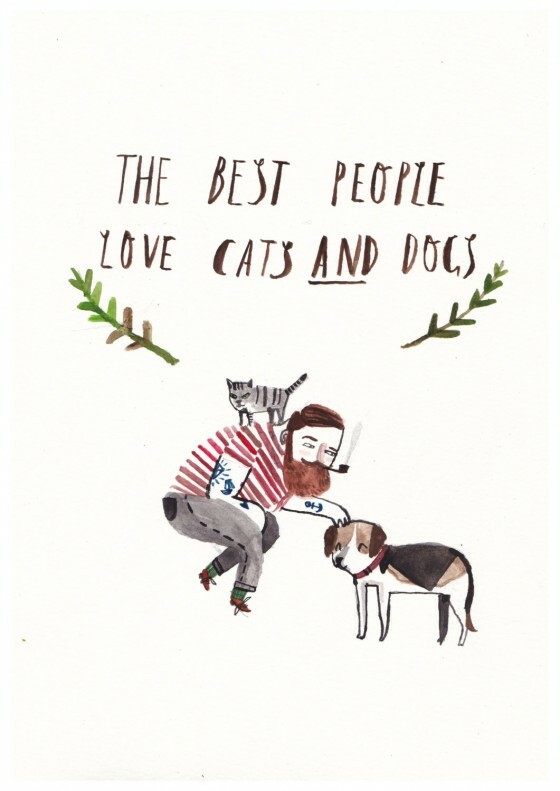 I’ve been crushing on these art zines made by Little Otsu, and they have a combo pack available! 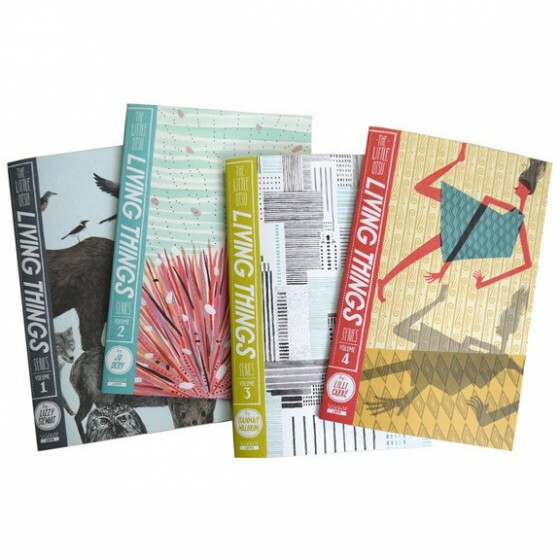 Great for satisfying your illustration munchies and to get your juices flowing as each book has different artists each explore one idea based around the theme of living things. Get yours here. I love clothes that are fun and bright. 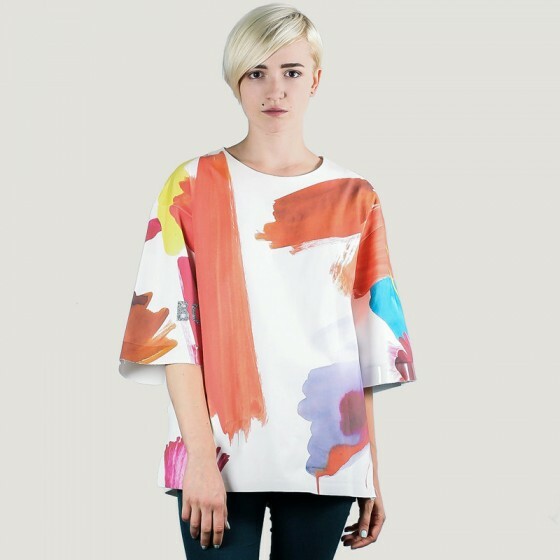 These collections – as a result of Ukranian brand’s SNDCT ongoing collaborations with artists and designers – will surely make you stand out in style. Available here. 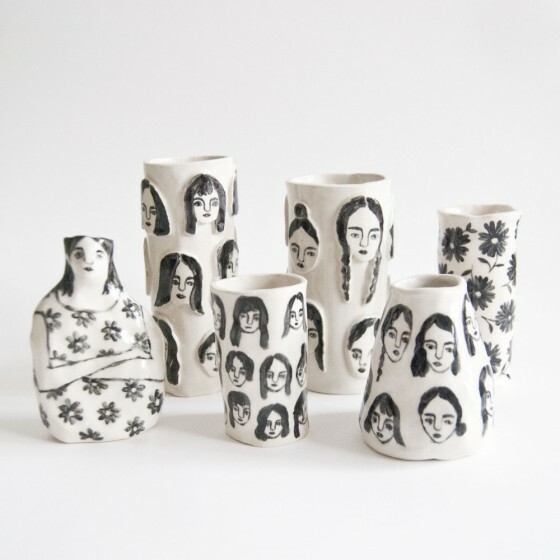 Hand built white stoneware vase with allover 3D girl heads by Leah Goren. Conversation starters? You bet. Available here. 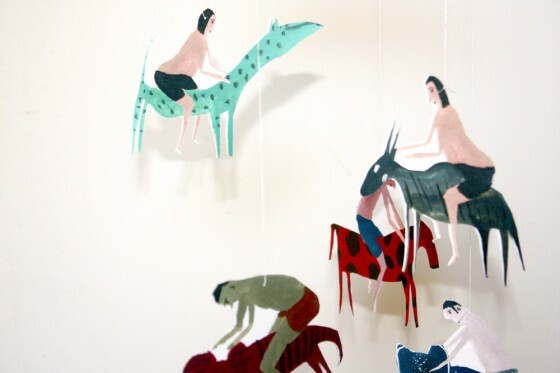 These funny looking people (and animals) are prints are from original gouache illustrations – seven in all – printed on heavy stock paper, punched and ready to hang. Some assembly is required, but that’s all part of the fun! Available here. 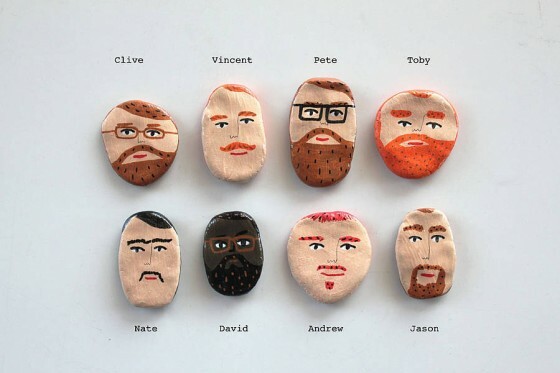 My husband always mentions to me that he’d like to carry me in his pocket. Not because I’m little or anything, but because I’m entertaining (I think). I bet he’s never heard of Nicola’s pocket manfriends though – they’re really much more pocketable, and I bet they won’t keep asking him for food. Available here. We’re almost coming to the end of the 2014 gift guide – so stay tuned for our final instalments! For the entire gift guide, check out this link!